An open letter to the boys who inhabit my house as Christmas draws near. Christmas Day brings with it a lot of excitement. This excitement can make boys forget themselves and step outside of the bounds of acceptable decorum. When this happens, it creates a situation known as Too Much Christmas or TMC. TMC can result in a boy having to spend valuable Christmas minutes alone in his room, composing himself so he can resume his place in a civilized family before the Holiday gets away from him. In order to minimize the risks of TMC, allow me to reiterate some general guidelines of behavior for boys of various ages. It is expected that you will wait until the entire family has opened all of their presents before you start tearing into the boxes containing your new toys and dumping the contents onto the floor. It would be wise for you to attempt to assemble only one new play set at a time, but if you insist on indiscriminately mixing sets, you should refrain from pouting when a crucial piece gets lost in the chaos. In fact, you should refrain from pouting for any reason. This is your favorite day of the year. Don’t ruin it with a self-induced case of TMC. Santa brought you some very nice toys. Play with them. We understand that you want to help Big Brother build his kit, or tear it apart, as the case may be, but he doesn’t need your help. Yes, it’s sweet that you love playing with him, but today he has enough trouble keeping his parts organized, without your little hands moving things around. Let him lose the first few pieces on his own so we don’t have to hear about how you ruined all his toys. Don’t put that in your mouth! There are all kinds of little treasures scattered on the carpet today. Most of them are not food. If we don’t give it to you, it probably wasn’t meant to be swallowed. We don’t look forward to spending Christmas digging stuff out of your mouth, but we will if we have to. That’s not going to be fun for any of us, remember that. Also, that’s probably Big Brother’s missing, crucial piece, so now I’ll have to hear about how you ruined his toys. Take a deep breath. You are the only one who would happily go up to your room and sit by yourself, but you are the only one not allowed to do it. It will be a madhouse, but you’ll get through it. You already had Too Much Christmas at about 7 a.m., but you’ve gotten your second wind. Yes, there will be whining and complaining – they will forget how happy they are at various points, but they will remember these moments fondly. That’s the important thing. Or maybe the important thing is when they’ve gone to bed and you can sit down with a tumbler of scotch. See? There’s always something to look forward to on Christmas. 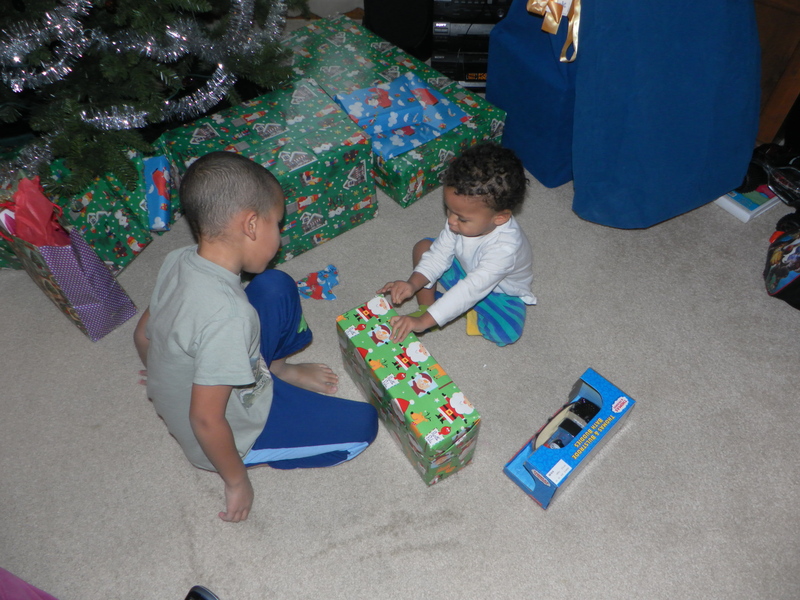 Nothing beats Christmas when all the little boys play together nicely (and then go to bed early). This entry was posted in Holiday Hijinks, It's a Guy Thing and tagged children, Christmas, Dads, family, fatherhood, holidays, humor, kids, parenting, Santa Claus. We all need to stay focused on our motivation and we’ll be all right. Merry Christmas. You have the blueprint for an most excellent Christmas, Snoozer. A most excellent life, I must add. Merry Christmast to you, your dear wife, and the three dear boys, my friend. Merry Christmas and a Happy New Year to you and yours, Mark. Having moved past the small children stage, I guess you’ve earned the right to have a little nip any time you want, even if it’s just for pleasure and not medicinal, as it will be for me. I may share a bottle of that Cab Sav that my dear wife Karen gave me for my birthday. Because I want to, not need to. 🙂 Merry and Happy, pal. This should become a holiday tradition: Christmas Advice for Boys. I am especially looking forward to the edition four years from now and 10 years away. Four years from now the boys will all be old enough to want similar toys, ten years from now the eldest will be five times larger, driving, and drinking a gallon of milk each day. You have fun times ahead. That’s a good idea, and if there is ever any evidence of anyone heeding the advice, I may continue to supply it. Outside of the scotch part, I’m not holding my breath. And Happy New Year to your awesome family. I wonder if your boys took your advice, but I’m sure you took yours and had some scotch after you finally got them settle down. Yes, it appears I’m the only one who recognizes good advice when he hears it. Happy New Year. I used to be exhausted after Christmas. Now I tell Santa to bring cash. It’s easier to open. And probably easier to put away too.